Check Out These Happy Cows! 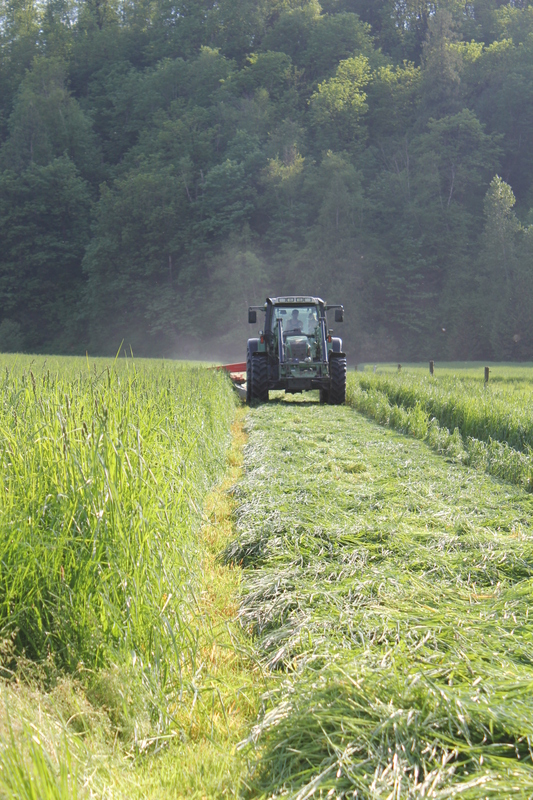 Grazing 2015 officially began today! 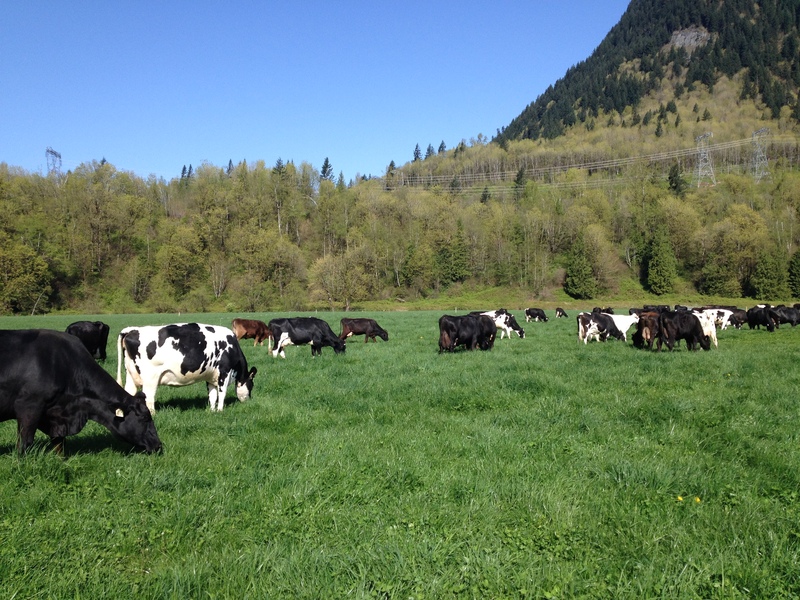 Organic dairy farms are required to pasture their cows during the growing season, weather and pasture condition permitting. We’ve had enough grass to pasture for about a week, but the ground was just too soggy to allow the girls pasture access. Today we decided that it was dry and firm enough for the girls to spend their first day outdoors. After spending the last 5 months in the barn (with access to a walkout area), the girls were extremely eager to head out to the lush buffet of grass. As we opened the pasture gates, they eagerly crowded to the back of the barn, and rushed down the laneway as soon as the gates were opened. Heels flew high and udders swayed from side to side as they galloped around the pasture, expressing their glee with snorts and high flying tails. Some of the older, more staid ladies settled down to graze fairly quickly. In my opinion, there’s nothing more blissful and relaxing than listening to the rhythmic tear, chew and swallow of a cow enjoying a good meal of tender young grass. What do you think? Looking out of my kitchen window now, 3 hours later, 1/3 of the herd is stretched out on the grass, enjoying the spring sun; 1/3 is grazing contentedly; the final 1/3 is standing and also chewing their cud – the picture of pastoral contentment. 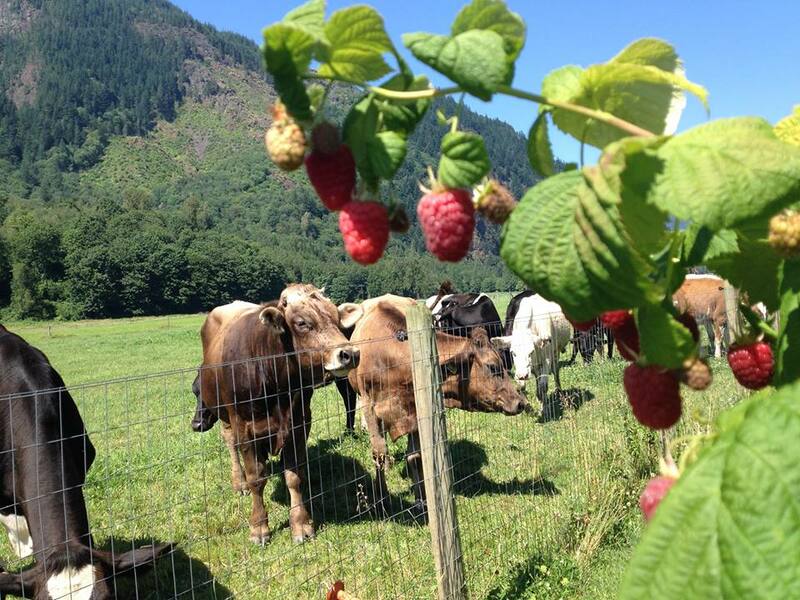 Here’s hoping we’ll enjoy a long and successful grazing season this year! A large part of a dairy farmer’s day is spent milking the cows. Each farm in Canada follows similar procedures, and all must adhere to the regulations set out in the Canadian Quality Milk (CQM) program. 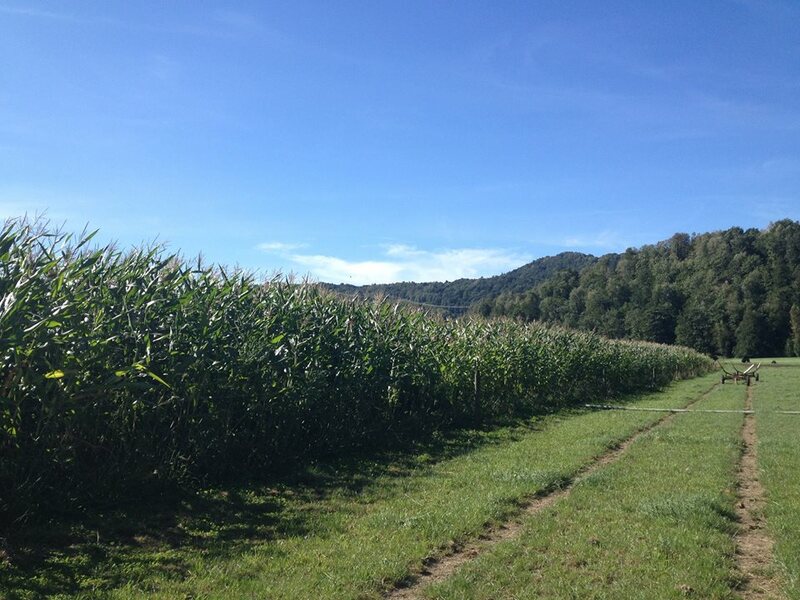 On our farm, we usually milk the cows ourselves; our 70 cow milking herd is easily managed by one person. We do, however, employ a lovely young lady who milks our cows on alternating Saturday afternoons. This gives us some time to spend as a family, either around the house or occasionally taking day trips together. We milk twice a day – beginning at 5:30 am and 5:00 pm – and each milking takes about one hour, excluding the associated chores, such as feeding calves and heifers. It takes about 8 minutes to milk each cow, some shorter, some longer. Each side of our milking parlour (the place where the cows are milked) accommodates 8 cows, so 16 cows are milked at once. 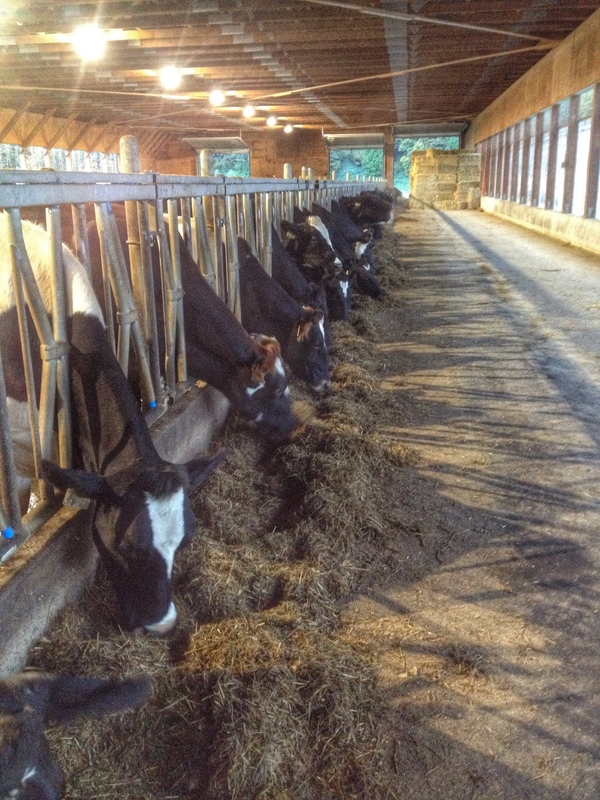 The rest of the day, our cows are free to roam about the barn, socialize with other cows, lie down in the comfy sawdust bedded stalls, munch on their specialized ration of feed at the feed bunk or head out to pasture during the growing season. 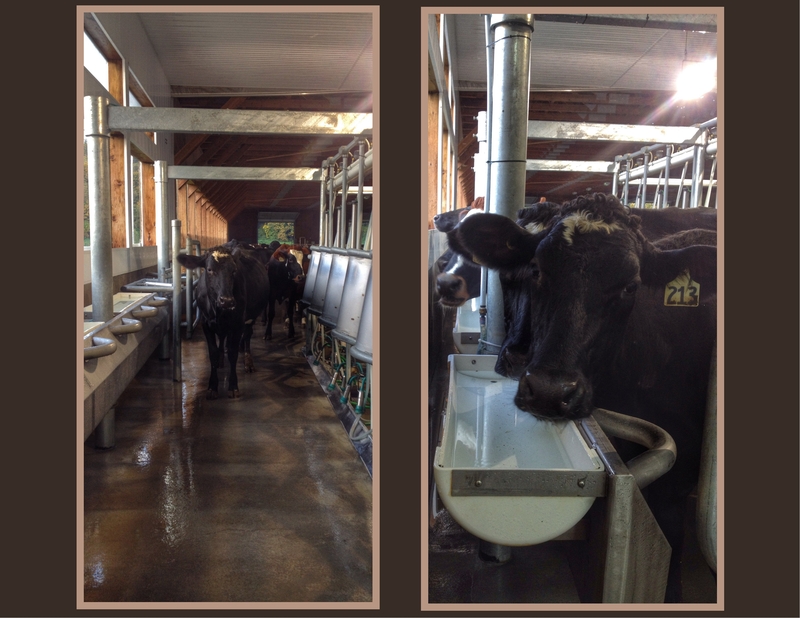 We’ve compiled a few photos recently that document our milking procedures. Enjoy! Near milking time, the cows start to gather around the milking parlour, eagerly anticipating the moment that we will open the gate allowing them access to the parlour. About half an hour before we are scheduled to milk, the parlour equipment that comes into contact with the milk is automatically washed and sanitized. This ensures that the equipment is sterile before contact with milk, keeping it safe for consumer consumption. Of course, milk is also pasteurized at the processing plant to totally eliminate the chance of milk-borne bacteria making a consumer ill. Once the gate is opened, the cows amble into the parlour. We always treat our cows gently and calmly, but this is especially important at milking time. Cows that are stressed or agitated will not allow their milk to drop, stress and agitation can block the milk let-down reflex. A cow that is not milked out properly will experience pressure and fullness in her udder before she is due to be milked again. 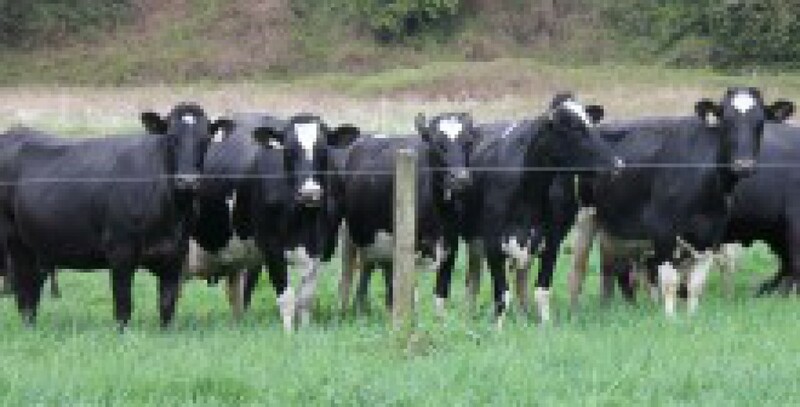 Repeated episodes of improper milking may lead to an infection of the udder, mastitis. Therefore, both we and our employee know that cows must be handled in a calm and quiet manner during milking. Our cows are accustomed to our parlour layout, and align themselves at a 45 degree angle to the parlour pit. Our parlour is laid out in para-bone style, a cross between parallel (milking between the back legs) and herringbone (milking from the side of the cow) styles. We attach the milking unit between the cow’s hind legs. When the cows have all moved over into the waiting area in the alley behind the milking parlour, we take a scraper and clean the manure or wet sawdust out of each stall, and spread more sawdust from the pile at the front of the stall into the area where the cows lie. We want our cows to be comfortable while they’re lying down producing more milk, and overall cow health is improved when cows lie comfortably as well. Once all 8 cows have positioned themselves properly, the back gate is closed and the brisket bar at the cows’ chest height moves in toward the parlour pit, ensuring that the cows cannot move around too much and possibly injure themselves or their neighbor. We designed special water troughs on the brisket bar that are filled with lukewarm water from the plate cooler (the plate cooler quickly cools the milk before it is pumped to the bulk tank). The girls often enjoy slurping down some liquid as they are being milked. Many cows also contentedly chew their cud while being milked; the milking process is comfortable, even pleasurable for a dairy cow. Before a cow can be milked, her udder and teats must be cleaned of manure splatters and sawdust shavings. We use soft microfiber cloths for this (see photo above). The gentle process of cleaning the udder also stimulates milk production. Some farms also use a pre-dip that disinfects the teats. We have had great success with just using our towels. Notice on the photo above that the cow’s udder is relatively clean. We take care to ensure that our cows’ stalls are free from manure and that the walking surfaces of the barn are scraped multiple times per day. As a result, less manure is present on the udder, making the pre-milking cleaning much easier. A clean udder also results in more sanitary milk. After waiting a few moments after wiping to allow the cow to get into the “milking moooo-d”, we attach the milking unit. A milking unit claw has 4 attachments – a specialized cup fitted with a soft, flexible rubber inflation – that are attached to each teat on the udder. Our units only produce suction when they are held upright. This eliminates the chance of manure or urine being drawn into the milking equipment should the cow kick off the machine or if it should fall to the ground. The suction produced is gentle but insistent, mimicking the actions of a calf’s mouth as it suckles from a teat. Milk begins to flow into the inflation, through the pipes to the plate cooler, then onto the bulk tank. If, for some reason, a cow has been treated with antibiotics, the hoses linking the milking unit to the pipeline that connect to the bulk tank are removed, and the milk is collected in a large bucket and discarded until the required withdrawal time has passed. The withdrawal time is drug specific, and is the period of time necessary for the last residues of the drug to be excreted from the cow’s system. Milk is tested on farm and at the processing plant to ensure that no antibiotic residues are present in milk. If the milk tested is found to contain antibiotic residues, the whole truck load of milk will be discarded and the farm responsible must pay a hefty fine. It usually takes about 5-10 minutes for each cow to finish milking. Once the sensors in the milking unit register that milk has stopped flowing, the milking unit automatically detaches from the udder. Each milking unit also measure how much milk each cow produces. This cow produced 15.9 liters at this particular afternoon milking. Cows generally produce a little more milk in the morning. This cow produces about 34 L of milk daily. 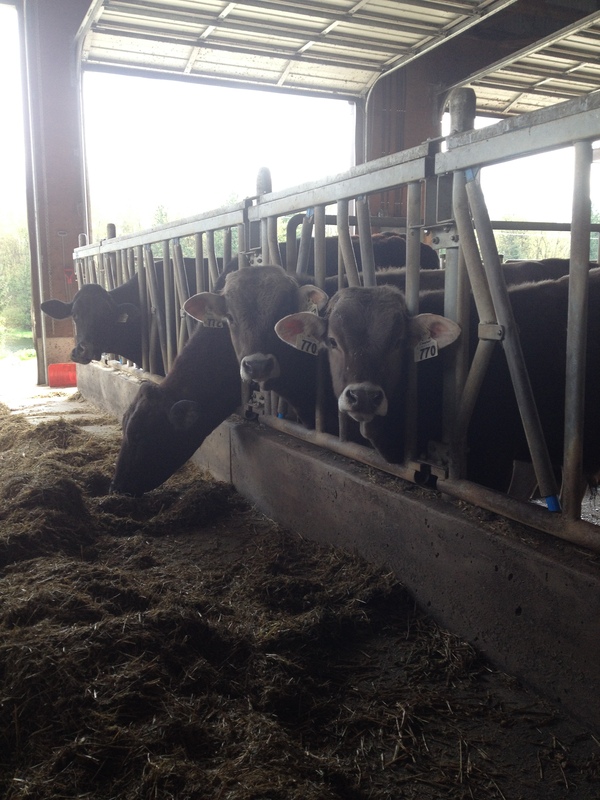 Brown Swiss and Brown Swiss cross bred cows generally produce a little less milk than their Holstein counterparts, but the butterfat and protein components in their milk are higher. 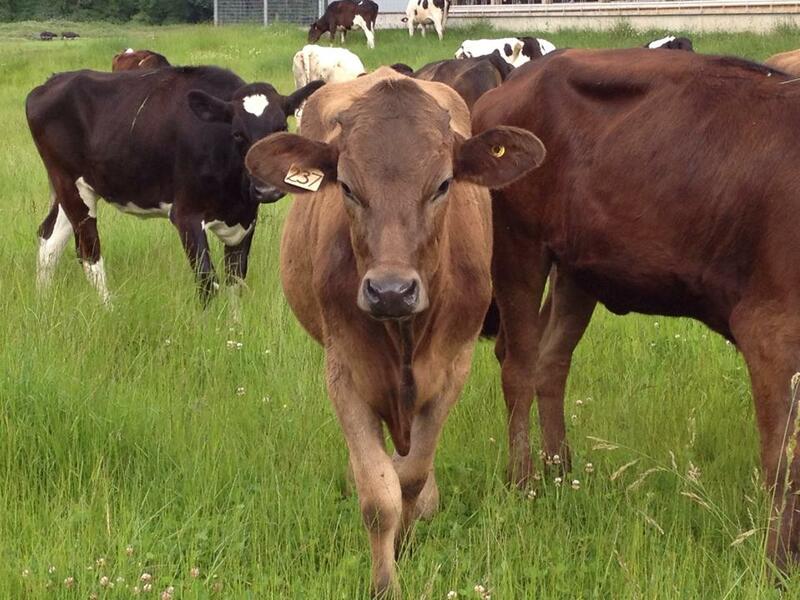 Our herd average butterfat currently is 4%, and the protein content is as 3.46%. After the machine detach, each teat is dipped in an iodine solution. The iodine helps to ensure that no bacteria will enter the still slightly open teat end, and also conditions the skin of the teat, keeping it smooth and supple, free of cracks and dryness. In the photo below, you can notice the difference in udder size, comparing before and after the cow has been milked. Once the entire row of cows has finished milking and all of the teats have been post-dipped, the front gate of the parlour is opened and the cows can return to the barn. The cows all head over to the feed bunk to enjoy a meal of their specially prepared mixed ration. After all, producing milk works up a good appetite! When the entire herd has been milked, the manure piles are scraped away and the parlour floors, wall, and equipment are thoroughly sprayed down with a high pressure hose. 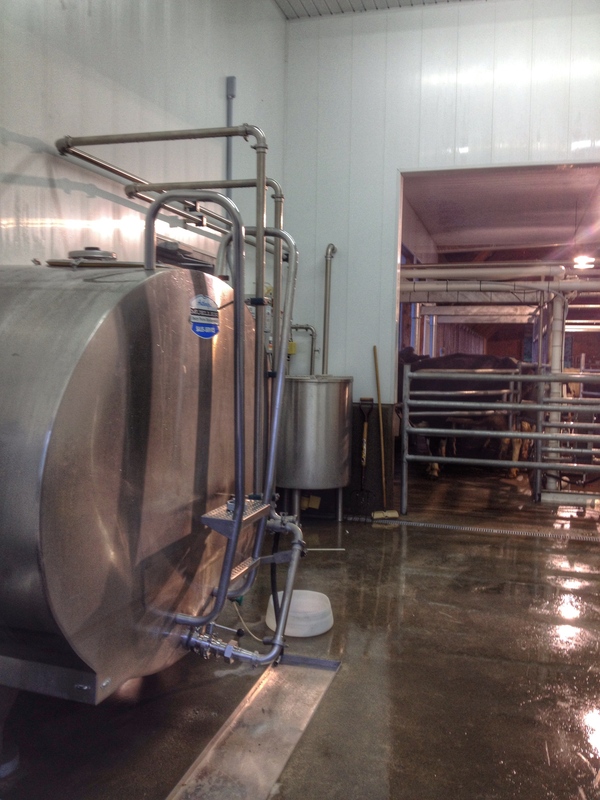 The milking equipment is sanitized and washed once again. The milk in the bulk tank is cooled and stirred until the milk truck comes to pick it up and delivers it to the processor. From there, it is pasteurized and packaged and sent to local grocery stores for consumer enjoyment. Farmers care for their cows. Verb? Noun? No matter, both most definitely apply to dairy farmers! Farmers feel sentimentally attached to the animals they own, while providing them with the necessities to ensure their health and welfare. Animal health and welfare are extremely important to dairy farmers. We know that in order for a cow to produce milk that is high quality and in good supply, she must be happy and healthy; therefore farmers place a huge emphasis on ensuring that the animals they own are properly cared for. 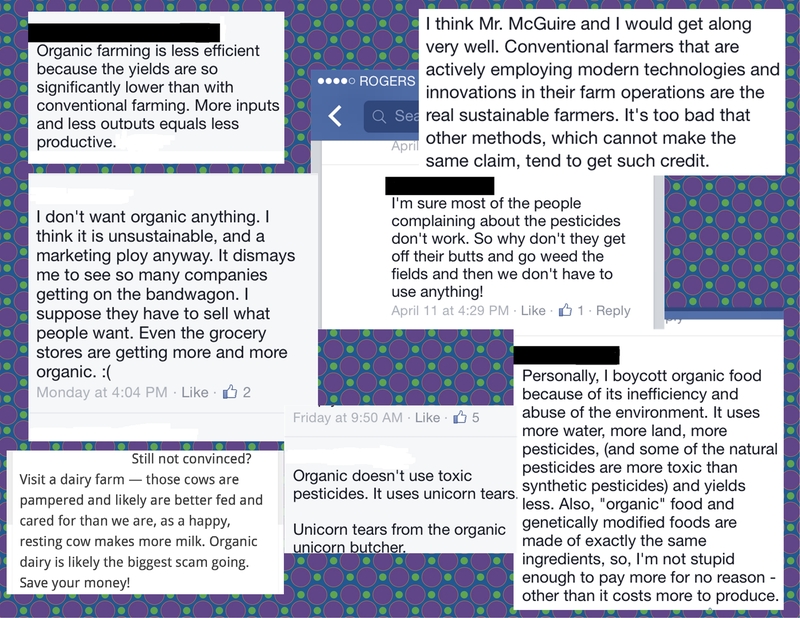 First of all, farmers pay close attention to the feed given to their cows. 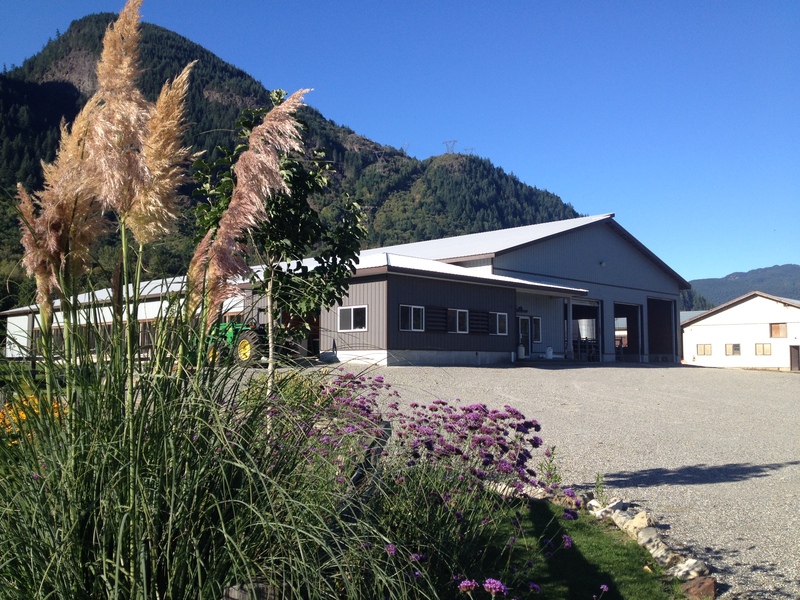 We take special care to secure high quality feed for our cows. Many farms across Canada grow the majority of their cow feed on farm but purchased feed can also account for part of a dairy farms’ ration. Both purchased and home grown feed must be high quality to guarantee cow health. Farmers work closely with trained and specialized nutritionists to provide the right feed and nutritional components for each stage of a cow’s life. 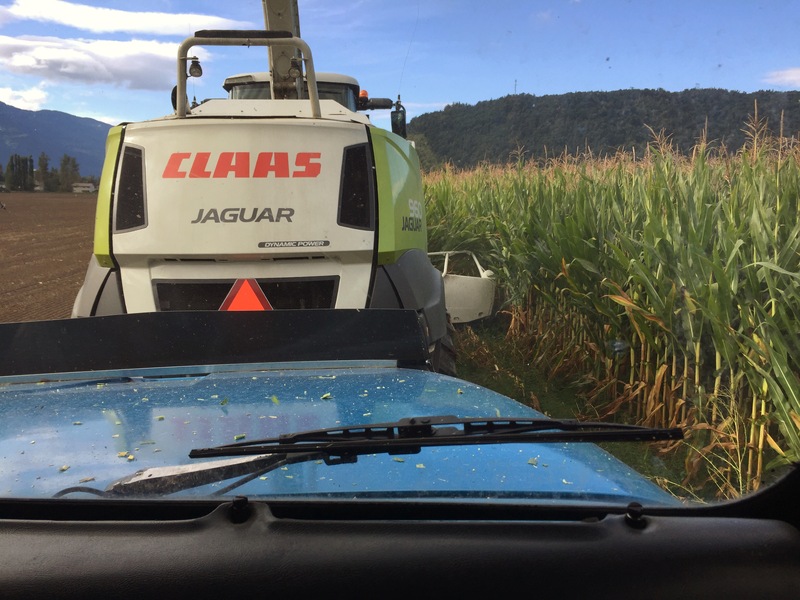 In dairy farming, what goes into the cows has a great impact on their overall health and wellness, which makes quality feed a high priority for dairy farmers. Animal housing also plays an important role in animal care. Across Canada, there are many different styles and types of cow housing, but one thing remains constant: our commitment to provide our cows with a safe and comfortable area to call “home”. Barns provide shelter from the elements: the heat of summer and the extreme cold of winter. 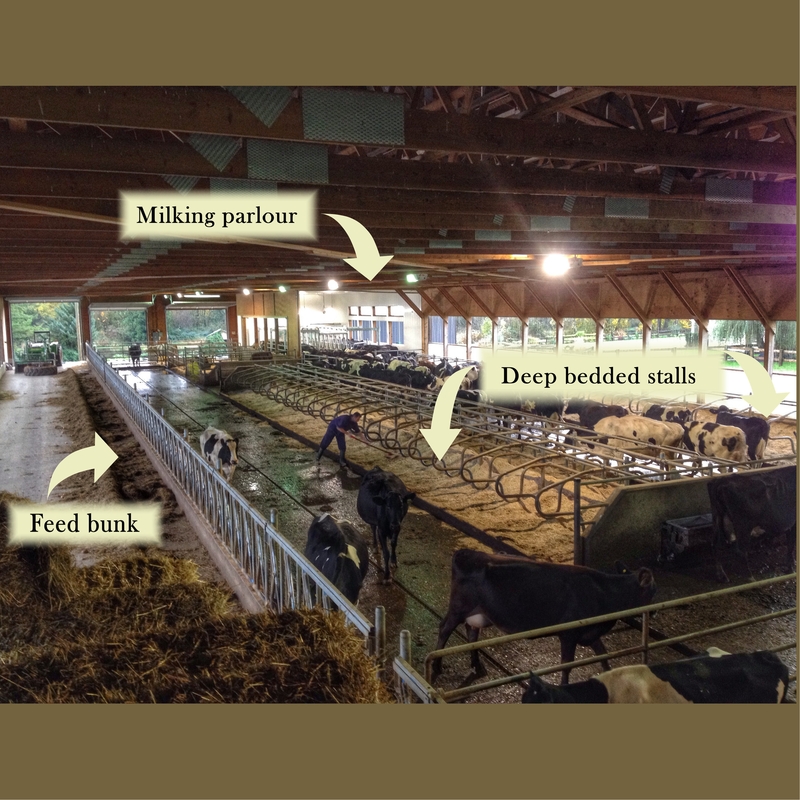 Proper ventilation and lighting are paramount in cow comfort; many barns have opaque curtained or paneled sides as well as large overhead doors at the front and back of the barn that allow light and air into barns. In our barns, our cows have plenty of room to move around and socialize with other cows and engage in normal herd behaviours. Our stalls are deep bedded with soft wood shavings; other farms use sand or mats for bedding and some farms even have water beds for their cows! 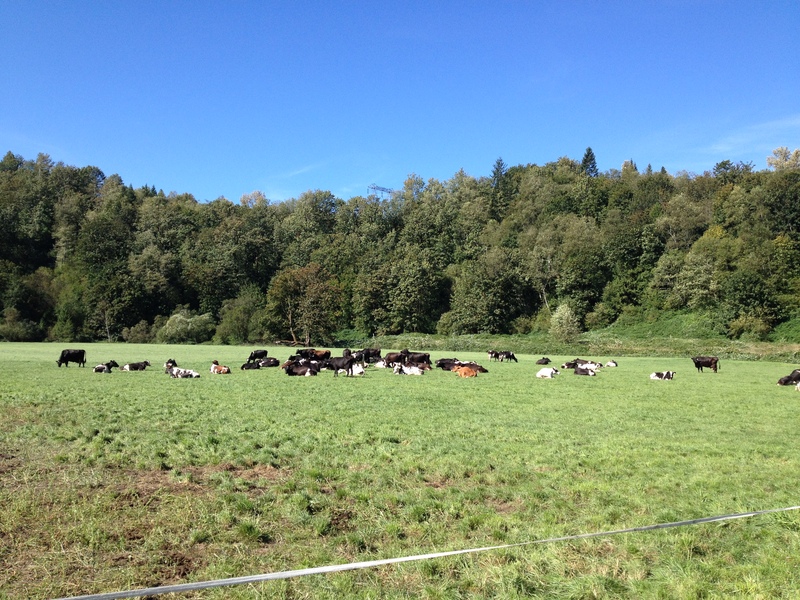 During the growing season, our cows have access to pasture. We find this improves hoof health and strength and cow health. Farms that do not provide access to pasture often install mats on the concrete floors in the barns to provide a cushion that mimics an outdoor surface. 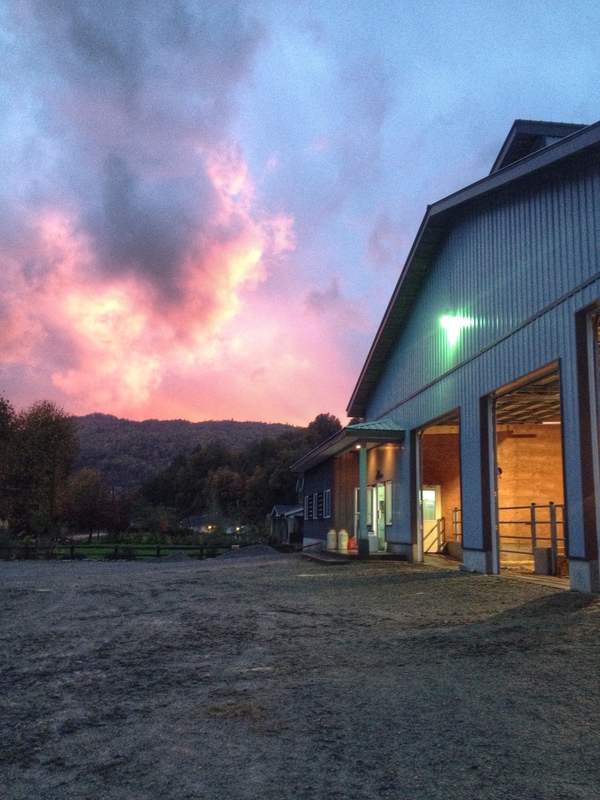 Dairy barns are cleaned multiple times per day, removing the manure from the barns via scrapers or through slatted floors, which provides a clean surface for the cows to stand on. 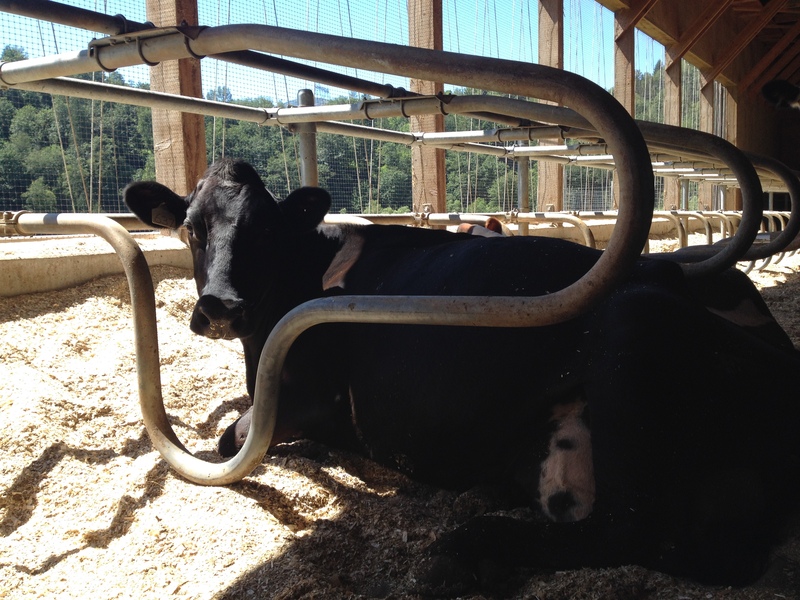 Regardless of barn type, farmers know that if a cow is comfortable, she will likely remain healthy and productive. This lovely lady is enjoying the breeze and sunshine flooding in through the opened curtained walls. Hoof care: We provide foot baths for our cows, which helps to stop the growth of painful fungi or infections of the hoof. If a cow has a sore hoof, she is less likely to consume proper amounts of feed and her body condition and health will suffer as a result. Healthy feet are a huge asset in a milk producing cow, so many farmers enlist the help of trained hoof trimming professionals who visit a farm multiple times per year to trim the cows’ hooves and treat any infections or lesions. Yes, our girls are pampered; they have more pedicures done in one year than I have done in 10! In between visits from the hoof trimmer, we will take care to treat any hoof problems that may arise. Disbudding: Calves are disbudded (their horn buds are removed with a cauterizing iron) at 3 weeks of age, a process that is quick and nearly painless. This process ensures the safety of a cow’s herd mates as well as farm staff. Our calves are sedated and given a local anesthetic and analgesics during the treatment. By the time the sedative has worn off, the calves are unaware that anything out of the ordinary has taken place! Antibiotic treatments: If a cow is ill or is suffering from an infection, such as mastitis, farmers will treat the cow with antibiotics to combat the infection, at the advice of a veterinarian. If a cow has been treated with antibiotics, her milk must be withheld from the food chain and is discarded until the drug specific withdrawal time (which is the time is takes for the drug to be excreted from the cow’s body) has passed. Of course, we also enlist the help of a veterinarian team to care for our cows. 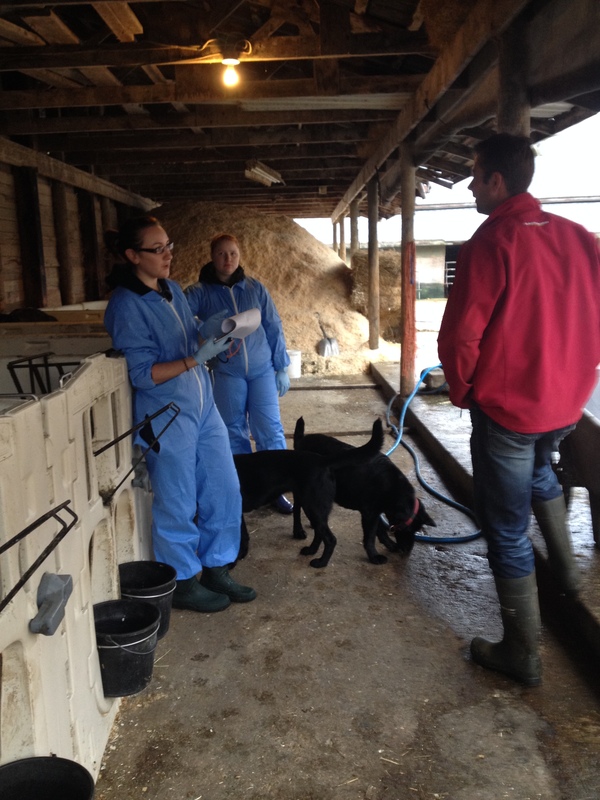 A vet visits our farm periodically to check our overall herd health and to check each cow’s prenatal status. Additionally, our vet is on call day or night, weekends and holidays, if any problem should arise which we are unable to resolve ourselves. For example, on July 1st, Canada Day (see my Facebook post on July 2 for more details and pictures) we called the vet out to our farm for an emergency. A cow had pushed her uterus out after a hard calving. Without veterinarian care, a prolapsed uterus is a sure death sentence for a cow. Thankfully, with proper treatment, the prognosis in such cases is excellent. The vet arrived promptly and soon had the uterus back in its rightful place. The cow is now doing very well and is showing no ill effects from the traumatic experience. Farmers and vets work together to provide the best possible medical care for dairy cows. Cleaning the prolapsed uterus before re-insertion. Perhaps the most overlooked but maybe the most important aspect of animal care is the frequent observation of the dairy herd. A good farmer or herd manager will quickly be able to notice any discrepancies or changes in cow behavior and health if they are familiar with the herd and normal cow attitudes and behaviors. Times of close contact with the cows, such as at milking time, are excellent opportunities to observe and record any disparity or change in cow health and wellness. 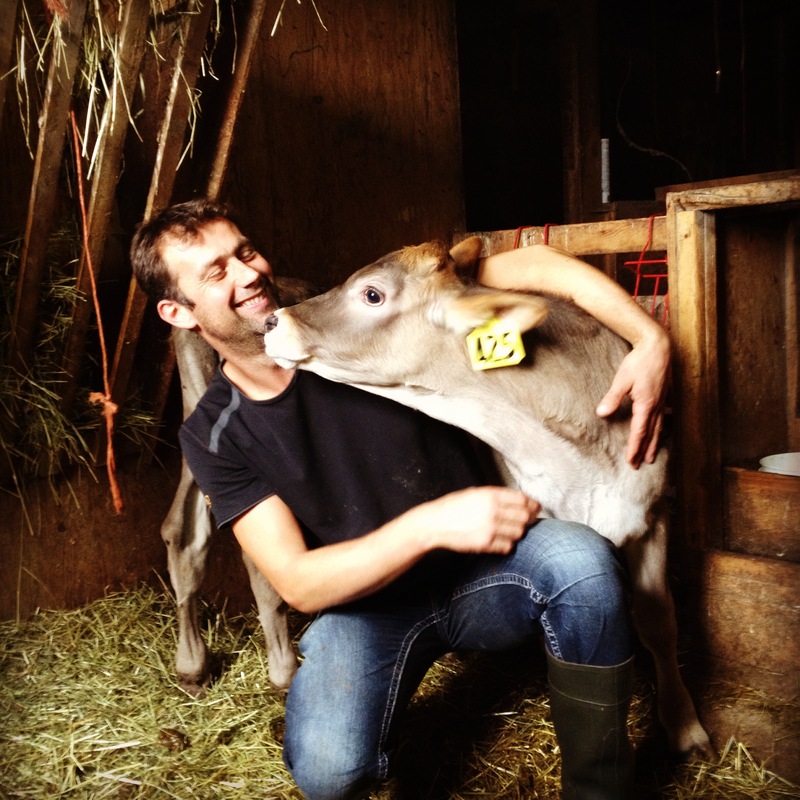 Times like these are also excellent opportunities for showing our affection to our girls – our most affectionate cows often meander over for head rubs and scratches if they see us in the barn. Cows needing extra attention of any sort can then be separated from the herd and have their specific needs compassionately and thoroughly attended to. 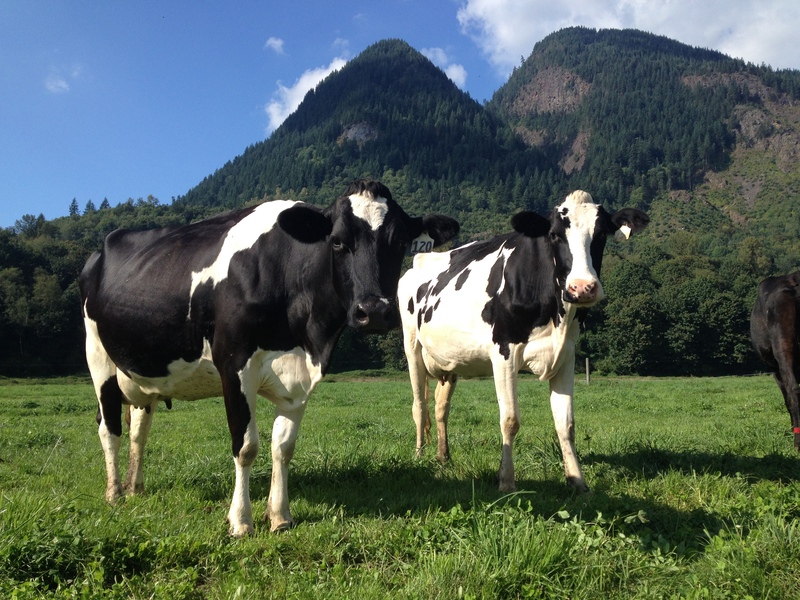 The animal welfare section of Dairy Farmers of Canada’s ProAction initiative, the Code for the Care and Handling of Dairy Cattle, which is now mandatory here in British Columbia, as well as in Saskatchewan, Manitoba, New Brunswick, Newfoundland and Prince Edward Island, delves deeply into animal welfare issues. 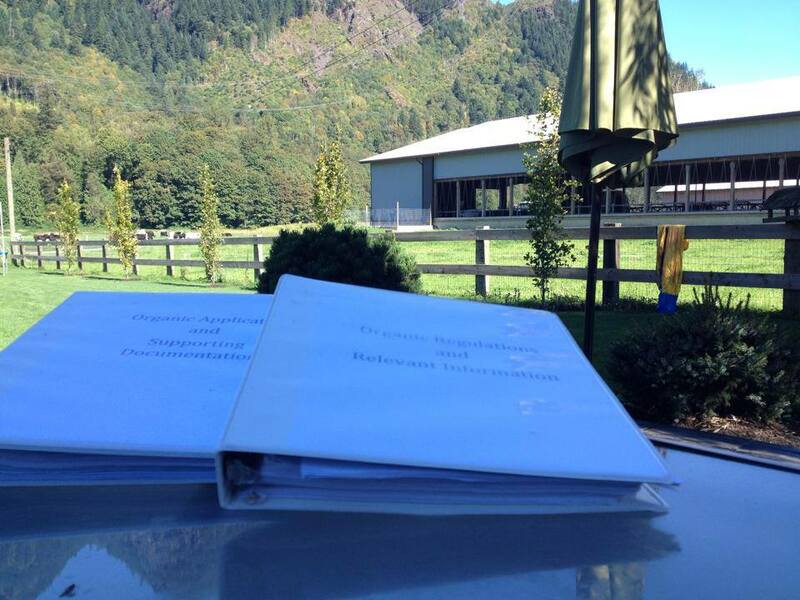 The Code deals with all aspects of animal care highlighted above, as well as cow transportation and euthanasia. If a cow must be transported to auction or slaughter, special protocols are in place to ensure that cows that are unable to withstand the journey or are unable to walk onto the transport truck are not transported at all. If a cow is too weak or ill to be transported, she must remain on farm until she is stronger or must be humanely euthanized if her overall prognosis of recovery is not promising. Farms in these provinces (and soon all across Canada) are required to abide by the Code and are subject to inspections to ensure that each farm places firm emphasis on animal care and welfare. 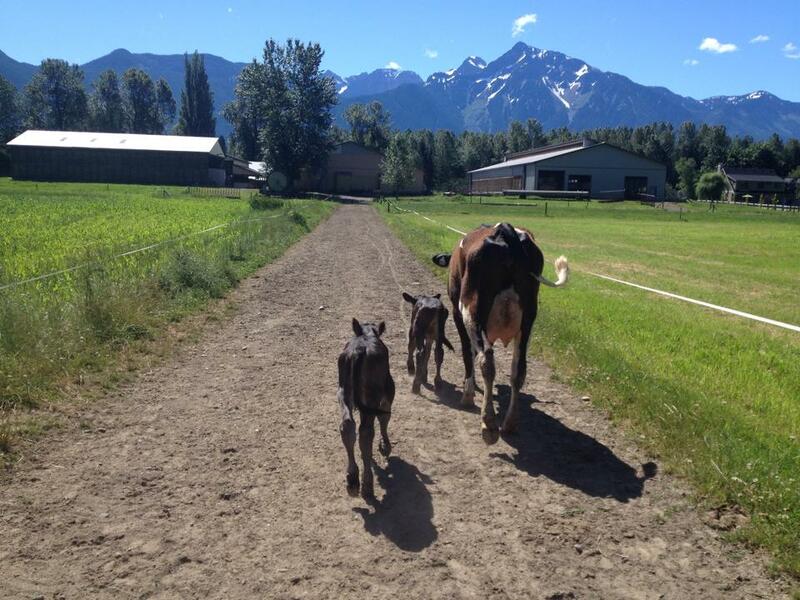 As dairy farmers, we take great pride in the care given to our cows. We take extreme care to ensure that our girls are comfortable and free of disease and pain and fear. We know that happy, comfortable, well cared for cows produce the best quality milk. And that, after all, is the dairy industry’s mission: providing Canadians with top quality milk that is produced by healthy and happy cows.